EC-Council is primarily known for its tremendous success in the Ethical Hacking industry but is making a bold step into the executive arena with their Certified CISO program. The motivation behind this new program is the same as the reasons behind the Certified Ethical Hacker (CEH), their biggest program - there is a gap in the industry. EC-Council's Certified CISO program is launching around the world with the CCISO Body of Knowledge, the CCISO training program, and an executive-level exam. While the title of Chief Information Security Officer has gained considerable popularity in the last five years, there is still a palpable dearth of both qualified information security executives and companies willing to put security in the C-Suite. This problem is highlighted by Target’s response to their recent security breach. One of the first steps they took to remediate the problems in their security program was to hire a CISO. Many in the industry have posited that if a CISO had been in place sooner, a more cohesive security program would have been developed that would have never allowed the apparent communication gaps that lead to the data breach. EC-Council hopes that by introducing a certification program that is tied to the title of CISO, the role’s visibility will be enhanced, leading to a change in perspective toward seeing a CISO as a standard part of any company. Another gap the CCISO program addresses deals with the lack of management and communication training the typical CISO receives. While there are other training and certification programs on the market today that address some of the technical aspects of the CISO role, the CCISO is the first to focus on project management, leadership, and strategic program development – skills that are crucial to the success of a CISO and a security program at large. Within the five sections, called Domains, of the CCISO program, there is one section, Domain 4, that deals with technical knowledge, but deep understanding of the technical aspects is assumed – the focus of the program is the implementation of that technical knowledge from an executive perspective. 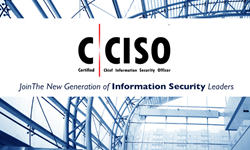 The CCISO program was developed by CISOs for CISOs. The CCISO exam was written from the perspective of high-level, practicing executives drawing from their daily challenges and career experience. Much of the exam is made up of scenario-based questions. These questions put the candidate right into a situation that a CISO might handled on the job and asks them to apply their knowledge and experience to answer correctly. The CCISO Body of Knowledge was written by a separate group of high-level executives who drew on their deep knowledge to delve deep into each of the five domains. The CCISO class is based on the CCISO Body of Knowledge and is taught by CCISO instructor Todd Fitzgerald, a practicing security executive. Fitzgerald uses his insights to bring the concepts of the program to life, drawing on his own experiences to illustrate abstract concepts or show how the application of a certain framework can impact the effectiveness of a security program. More information about the CCISO program can be found here: http://ciso.eccouncil.org/. For more information about EC-Council, please visit http://www.eccouncil.org.